Paper forms have been, and continue to be a useful and necessary part of doing business for many individuals and organisations. They have provided a way to uniformly collect same or similar information, at a lower cost than doing so without their aid. Especially where regulatory and/or legal considerations are present, forms constitute an integral part of many organisations’ business processes. 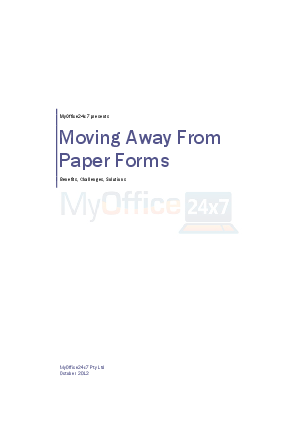 Paper forms, however, are not without their downsides – many of which can be addressed by the adoption of electronic forms into any organisation’s day-to-day operations. This whitepaper will convey instructive, useful advice to start transitioning your organisation towards effective use of electronic forms. We will bring your attention to a comprehensive suite of strategies and pitfalls to make the transition as predictable and pain-free as possible.